Typically, dentures are supported by the gums and are secured with the daily application of adhesive materials. This method can restore some function to your smile, but the daily maintenance is far from ideal. Unfortunately, denture adhesives can unstick at the most inopportune times causing embarrassment and discomfort. Denture adhesives can also make fitting your dentures snugly into your mouth a hassle, interfering with basic functions such as biting, chewing and even speaking. As an alternative to all the issues involved with regular dentures, Implant Supported Dentures do not rely on adhesives. Instead, they use Dental Implants to securely hold the dentures in place. By using Dental Implants, it prevents slippage and makes for a seamless, beautiful and functional smile! An Implant Supported Denture is an over-denture that is supported and attached to dental implants. Normally a regular denture rests directly on the gums and is held in place with adhesives. Implant Supported Dentures are used when you do not have any teeth in your jaw, but there is still enough bone structure left to support the installation of dental implants. 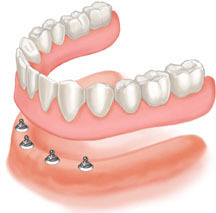 The Implant Supported Denture then has special attachments that snap onto the dental implants. Typically, Implant Supported Dentures can be created either for the lower or upper jaw, depending upon your specific needs. The maintenance of your Implant Supported Denture simply requires that you remove them daily to clean the denture and surrounding gum area. Just like regular dentures, you should not sleep with them in at night. If you do not want to continually remove your Implant Supported Denture, you can also consider permanent Dental Implants for a full arch replacement. What Type of Implant Supported Dentures are there? There are two types of Implant Supported Dentures available: the bar-retained or the ball-retained. Both types of dentures require at least two dental implants for support. Bar-retained dentures — Consists of a thin metal bar that follows the curve of your jaw. It is then attached to between two and five implants that have been previously placed in your jawbone. The denture then fits over the bar and is securely clipped into place. 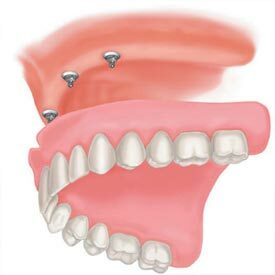 Ball-retained dentures (also known as stud-attachment dentures) — Each dental implant in the jawbone holds a metal attachment that fits into another attachment on the denture. In most cases, the attachments on the implants are ball-shaped (“male” attachments), and they fit into sockets (“female” attachments) on the denture. In some cases, the denture holds the male attachments and the implants hold the female ones. Your Implant Supported Denture will be much more stable than traditional dentures. You will find that you don’t have to worry about the denture becoming loose or falling out of your mouth and you should be able to eat foods that you could not eat before! But you will still have to be careful about chewing hard or sticky foods as they may damage the denture. No single solution is ideal for every smile. But during your initial consultation, we will be happy to discuss all of your options, address your Dental Implant questions and help you find the solution that is best suited to meet your needs! Call Cornerstone Dental at (403) 995-1800 to request your Implant Supported Dentures appointment today.